I like that this one isn't heavily populated and the people and profiles are as real as they come. That makes it much easier to deal with and makes dating fun. I think it is a good thing they increased their security, I'm considering signing up and I don't really mind filling in more information if that makes this site more reliable, I also like that it has an inbox and other features mentioned on the post like chemistry and date night. Why cant i log in into my acct.. it always says invalid password/username...but when i try to retrieve my password it says my email is not on their data base...why is that? lm in this site, my name there is hua0 ok if you interesting you can check me there. Wondering why I can't get on the site tonight. I keep getting the same thing..site unavailable. Replied to vanessa Maybe it was under maintenance, POF has never been down for me though and I really like it, I believe it is better than eharmony and match, I actually have met some really nice honest guys but as always you have to be careful and ask them to webcam chat with you to see they are who they claim they are... have you met anybody? 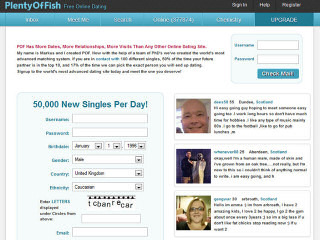 I was a member of pof and the site is crap is just as the same as any other dating site on the planet and is full of scammers and not for getting fake profiles nothing new there. There are scammers on every dating site. The best way to meet is face to face and i have been there and it works. Dating sites are a no go area as i said face to face and you won't go wrong. Hi im 29 lookin for friends maybe more, I enjoy motorcycles and spendin time with family. Hello... hot and 50 looking to meet someone who has similar interterst like hiking or cooking.